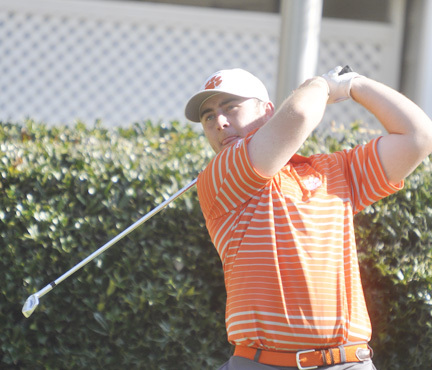 Austin Langdale led Clemson in the final round of the ACC tourney. The Clemson Tigers battled two of the top teams in the country for the ACC team title. Clemson and Georgia Tech finished a shot in front of Flordia State at the end of regulation play in the conference championship played at the Old North State Club in New London, NC. Senior Billy Kennerly birdied the final hole to force the playoff with Georgia Tech. The five man playoff took two holes before Tech was able to repeat as ACC champions. “I can’t tell you how proud I am of this team,” said Head Coach Larry Penley. “They never quit, even when the scoreboard showed us five shots out with just a couple of holes to play. To score three birdies on the last hole to force the playoff was quite an accomplishment. Cody Proveaux forced a second playoff hole when he made a pressure packed 5-foot birdie putt. On the second playoff hole Georgia Tech made four birdies while only Austin Langdale was able to make a birdie for Clemson. “This was the first time this year we have played in the same tournament with FloridaState, the nation’s number-one ranked team, and we beat them by a shot. That was a good accomplishment and we took Georgia Tech to the brink,” said Penley. Kennelry finished in a tie for seventh place for his sixth top-ten finish of the year. His second round 6-under par 66 tied for the lowest round shot in the tournament. “I can’t say enough about Billy Kennerly’s play this week and another top 10 finish in a strong field. We had great contributions for everyone this week,” said the Clemson coach. In addition to Kennerly’s seventh place finish three other Tigers ended up in the top-twenty. Miller Capps was ninth and Stephen Behr was tied for 14th. Austin Langdale had the best final round for the Tigers shooting a 3-under par 69. Langdale’s round included an eagle when his second shot on the par-4, 10th hole landed in the cup on the fly. “I think we are in the good place entering the NCAA Tournament next month. There was no panic from this team and that was a good sign today,” concluded Penley.